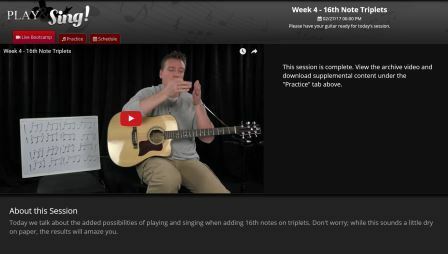 This Jamplay guitar lessons review has been updated. I decided to completely start from scratch since there has been a lot of changes since I last reviewed it. I have kept the old review that I had which you can read at the end of this review. Could be more song lessons – what’s there is really good but I feel like there could be a lot more in there. And with time there will be. The volume of everything else is almost scarcely believable but they could do with more songs in there. 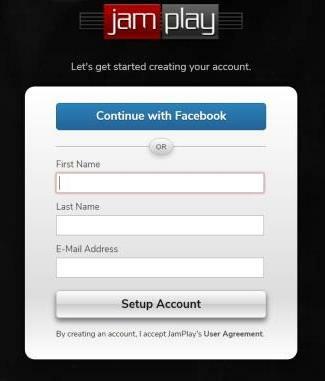 Who Jamplay is Best Suited to? I feel like it’s a cop-out to say this but really it’s suited to any guitarist out there. The beginners section has really improved since I last reviewed it, so it’s definitely good for beginners and great all the way up to advanced and expert level guitarists. For those on a budget, it’s also great. It’s one of the more affordable online lesson platforms and compared to in-person lessons you could a whole year’s subscription for the price of a half dozen or less in-person lessons. There’s also a huge variety of genre specific lessons so they cater to a massive amount of different styles of music tastes too. Here’s an overview of what to expect when you you set up your account. There are some questions for you to answer about your playing background, your goals and then you can fill out your profile and add pictures, if you want. Cool that they ask for your goals and how much time you are able to commit each week. This helps with progress tracking and making sure you improve. Sure, some of these questions are probably used by Jamplay internally to make Jamplay better – but if it’s making the system better, then that’s not really a downside. This area has changed since I last reviewed Jamplay. The layout is easier to follow with a top menu that follows you down – which I like. Since I last reviewed Jamplay, there is now more of a focus on the community aspect of the site. So if you want to discuss things, ask questions etc, that’s really easy to do. There is also more of a focus on live courses, if that’s something you would want to get into. This applies to all of the lessons in all the phases. There are 13 different instructors that do beginner acoustic guitar lessons. Seems like they all cover all of the basic things you would want to know so it’s a matter of browsing through and finding the instructor that you like the most and that teaches in a style that you like the most. Then it’s just a matter of following through all of their lessons. This is pretty easy to follow and understand and following through each lesson should give you a solid foundation. If you were really keen to make that foundation even more solid, you could go through all of the lessons of more than one instructor. In my opinion, you are better off doing all of one instructor before moving to the next one (if you plan to do more than one set of beginner lessons) – if you chop and change between them, you’re progress will be much slower and more confusing. So find the instructor that you like and stick with it through to the end. The other thing these beginner lessons are great for is any guitarist who was self-taught and wants to fill in gaps in knowledge and work on technique deficiencies. The first part is all about learning a specific genre. So there’s heaps there. No matter what style you are trying to learn there should be something there for you. The second part of this phase is all about enhancing your skills. Skills that can apply across genres. As you can see there’s heaps in there that can keep you going for a few lifetimes! I wouldn’t so much call this a phase myself – you’ll no doubt have learnt countless songs if you were to go through phases 1 & 2 before coming here. But whatever you want to label it, this is a really valuable part of Jamplay. Have you ever looked up tab online and found it and tried to play along to the song but you either couldn’t quite get it or it just didn’t quite sound the same. These songs are video lessons that take you through the song and break it apart and teach you it from top to bottom. By my count there are some 360 songs in there, in various styles and various difficulty levels. Whilst this sounds like a lot, I would like to see more of these in there. They are adding stuff all the time so this number will go up. The final phase – again, I wouldn’t necessarily call it a natural progression from phase 2 or 3. But your song writing will certainly have more places it can go if you are more advanced in your skills. And you’ll need a decent grounding in guitar to understand what’s going on too. There are 8 instructors who take courses on song writing for acoustic guitar and 1 instructor for song writing on the electric guitar. Also under the lessons menu you’ll find the Artists Series and the Lick & Riff Library. 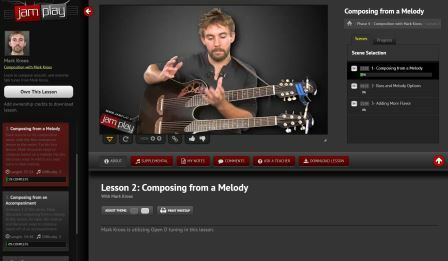 Jamplay seems to have placed a real emphasis on live lessons since I last reviewed it. This is pretty cool – and part of what makes it cool is that all of the live lessons are archived and you can go back and watch any of the past live lessons. The live lessons menu is separated into Active Courses and Archived Courses. I really enjoyed having the Jam Tracks tool. It’s really fun to be able to go in and play along to a backing track, especially if you don’t have other musicians to jam with or they’re not available but you feel like a good jam. I had heaps of fun on the 12 bar blues jam track. I also found the training games really fun – but that’s the music geek in me! I really like to see my progress and I also believe that being able to track your progress is really important when learning anything. The progress tracker gives you that information as to where you are on the map. If you don’ know where you are then you want know which direction to head in to get to where you want to go. So for me this is a great feature. 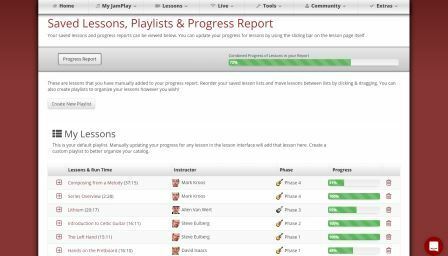 Now in my progress report currently I have a bunch of unfinished lessons but this is only because I was going through and checking out different aspects of Jamplay for this review. In my opinion you are better off mastering on aspect completely and then moving on to something new. I really feel like this is an aspect of Jamplay that they’ve really stepped up since I last reviewed their system. Either it’s improved a lot or the layout just makes it seem more accessible. I think the biggest improvement here is the “Ask a Teacher” section in all of the lessons. This is great to have there for any questions you might have (which may have already been answered as all the questions and answers remain in the lesson). I especially like the fact that you can ask a question right there in the lesson and don’t have to leave the lesson to go off somewhere else to ask the question. And all the questions and answers contained in there are relevant to that lesson (well, most of the time anyway!). And there are live Q & A sessions with the instructors too which is pretty awesome. This is also a new aspect since I last reviewed Jamplay (they’ve been busy!). You collect points for completing lessons and for other things. This was in Beta at the time of writing but they plan on enabling members to use their points for special access and privileges in the future. I’m hoping that they make whatever you get something that’s valuable because it would work as a nice motivator if they do. Hands down this is value for money. You can get a whole year’s worth of essentially unlimited material for just $159. If you were to get in-person lessons it would cost you at least $1,000/year and you would be limited to one lesson per week for that. There are advantages and disadvantages to online and in-person lessons but in terms of value for money overall, online lessons are quite far ahead. But that’s only if they’re good and Jamplay is one of the good ones. Also, Jamplay is actually really reasonably priced among online guitar lessons even. You get the option of a free trial to start with too and there’s a 30 day money back guarantee (used to be only 7 days so that’s another nice little improvement). A couple of things that impress me about Jamplay at the moment. They have listened to some of the points on their weaknesses and they’ve improved a bunch of things. It shows they listen to their users and that they are actively improving the platform all the time. Despite an almost inconceivable amount of material that they have, they are still uploading on average 11 hours of video lessons every month. This isn’t a stagnant website by any means at all. This is a constantly improving beast. By the time you read this I may need to update my review again! 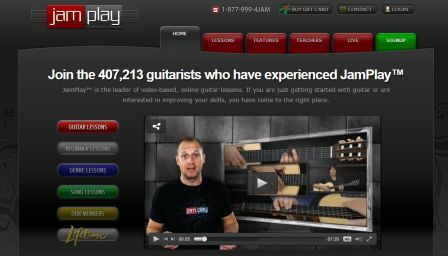 Jamplay.com is a big player in online guitar lessons – and for good reason, as you’ll see in my Jamplay guitar lessons review below. Before I checked out Jamplay for myself I sort of wondered how they could be much better than the free lessons I had reviewed leading up to reviewing Jamplay. But I learnt very quickly what you can get when you invest in the right online guitar lessons. That’s certainly not to say that there aren’t paid lessons that aren’t worth their money. I’m sure there are free lessons out there that are better than some of the paid options. But Jamplay definitely doesn’t fall in that category. If you’re looking to get the best of the best and don’t mind paying for it (and really not all that much to be honest) then you should definitely check out this review. I will try to be as detailed as possible so you get the most accurate information. Jamplay is o.k. for beginners. But there are a couple of others out there that I think would be better for beginner guitarists. 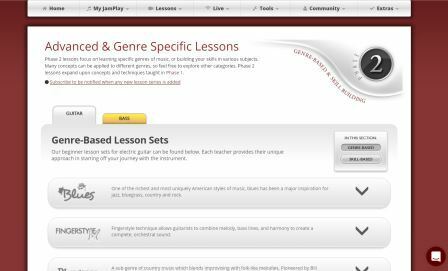 Jamplay is the #1 lesson provider, in my opinion, for anyone who has the basics of guitar well mastered and who wants to expand their repertoire. Think of a genre/style of guitar you want to play…. now go to Jamplay….. there’s a really good chance that they’ll have oodles of stuff on any particular genre of guitar you’ll want to learn. 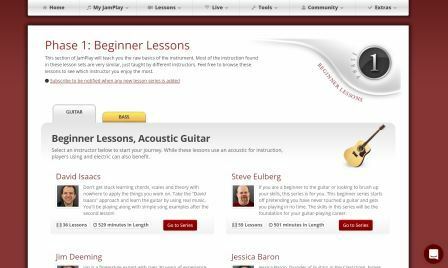 There are cheaper online guitar lessons – but Jamplay is pretty darn reasonable, especially when you consider the cost of in-person guitar lessons. I would like to see a free trial however. They have a 7 day money back guarantee but I’d like to see a free trial that didn’t require a paid sign up to begin with. UPDATE: Jamplay now have a free trial! No credit card required or anything – they’ve made plenty of other changes too – see my new review at the top of this page for more. I will go through and give an outline of each phase. Obviously I haven’t had a chance to go through all of the lessons as there is an absolute massive amount of stuff available so it would take forever to get through it all. But I have looked through everything and completed several of the thousands of lessons available. They also provide bass lessons but I have not looked at these. This review is solely based on the guitar lessons. The first phase is for beginners. The lessons will teach anyone from knowing absolutely nothing about the guitar to being able to play at an intermediate level. Even if you have been playing for a while I would suggest doing some beginner lessons to ensure you fill any gaps in your technique – even if you go through the lessons quickly. There is a huge amount of material here and heaps of different instructors (which is really good to get variety and so you can pick an instructor that you like – see below for more on why having a choice of instructors is so good). 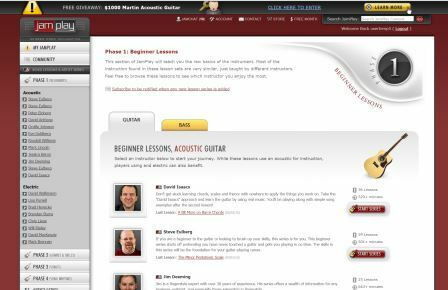 There are two main sections in the beginner phase – acoustic lessons and electric lessons. There are even lessons designed just for kids. And with so many different instructor options you should be able to find something that is just right for you. From the lessons I’ve been through they are really thorough, include proper techniques, a host of alternate techniques (one or another technique may suit you better for whatever reason) and heaps of handy tips to make things easier to get and easier to remember. The lessons include multiple camera angles so that you can see precisely what is going on and real time fretboard diagrams are used to make it even easier to follow. Within each instructor’s lessons there are progress bars for each lesson to see how much of each lesson you have completed. This is a nice visual way of seeing your progress through the lessons – and works as a good motivator. I’ve never seen the amount of different genres that are on offer here. And for each genre there are multiple instructors with multiple lessons each. This is all just for the blues genre. And there are heaps of different genres to choose from. See the list below. And then there’s the other part of phase 2 – skills. This part teaches a bunch of stuff including improvisation, theory, rhythm, soloing, using a capo, singing and playing and a whole heap more. Again there is a wealth of information here and it’s all super easy to follow (assuming you know the basics of guitar to start with – if you don’t see Phase 1). The 3rd section on Jamplay is all about learning songs. And you don’t just have to settle for downloading the tab and listening to the song and trying to work your way through it- the instructors take you through the songs step by step. So now that you’ve learned the necessary skills needed in the Genre and Skills phase you can apply those new skills to songs (but of course you would also have been learning songs along the way in Phases 1 & 2). Instructors take you through the song step by step so you can learn each song how it’s supposed to be played. As well as taking you through the song in full, showing you each part, the tab and musical notation is provided so that you can follow along through if it helps you to learn that way too. If writing songs is more your thing and you want to improve your writing abilities then phase 4 is for you. There are 7 different instructors for acoustic guitar song writing and 1 for electric guitar song writing. This section doesn’t appear as comprehensive as the others but there is still over 26 hours of acoustic lessons and over 9 hours of electric lessons. The artist series is comprised of lessons from various artists. This will give you a great insight into their styles. Each artist has a different focus for their lessons. This is a bonus really – but a nice bonus to have. There are over 450 lessons between them and the artists have anywhere from 5 to 50 lessons each. This is again split into acoustic and electric with over 311 of those lessons on electric and 154 on acoustic. O.k. Now let’s see how Jamply rated in each of the sections of my rating system. As you can see Jamplay scored really well overall. I would highly recommend this program to anyone looking to learn guitar through online lessons. And not that popularity is necessarily a true indicator, but Jamplay has over 400,000 subscribers – they’ve got to be doing something right to get that many wanting to take their lessons. Read on to learn more about how they scored in each area of my rating system. As you can probably tell from the outline of the materials above, there is a veritable crap load (excuse my French!) of materials within Jamplay’s website. Of course, like I have said there is no way I could go through the sheer volume of stuff for this review but what I did go through was extremely thorough and covered everything I could think of – it’s hard not to be able to with that much stuff and that many high calibre instructors. Quantity is one thing but if the quality is missing it isn’t much good. But Jamplay don’t certainly don’t slack off when it comes to quality. Part of this quality is down to the quality of instructors (see below), ease of following (see below), thoroughness (see above), variety (see below) and enjoyment (see below). However, I haven’t given them full marks for this because sometimes the lessons can go off on a bit of a tangent and the instructors go into stuff that might be beyond the level of the student. They’re could be a slightly better structure as to how the lessons proceed, particularly with some of the instructors. There are certain learning styles and communication styles that are going to be better suited to you and make it faster and easier to learn. With so many different instructor choices there is a very good chance that one will suit your learning/communication style. If there was just one, and you didn’t learn well from their style, you would be stuck with them. If you don’t like an instructor’s personality it’s just going to be less enjoyable and, whether consciously or subconsciously, you will put off doing the lessons or dread doing the lessons – either of which is not good for your guitar progression. Chances are you’ll be less inclined to practice too. You have the opportunity to learn from a range of instructors (i.e. pick more than one and do multiple lessons from multiple instructors for variety) for a more thorough foundation if you choose. If you have read the outline of the Jamplay lessons above then you will see that Jamplay have heaps of different instructors – both male and female. Overall there are currently 35 acoustic guitar instructors and 51 electric guitar instructors. But that number of instructors – like the quality vs quantity of the lessons – isn’t much good unless those instructors are quality. All of Jamplay’s instructors not only have years and years worth of experience playing the guitar, they also have years and years worth of experience teaching the guitar. But as I mentioned above, the structure of some of the lessons could be tweaked and some instructors can go off into an area that the lesson doesn’t warrant. As a whole it’s good but there is some room for improvement. There is material for almost every level and style of guitarist that you can think of from beginners to more advanced guitarists, from classical to jazz to rock to metal and everything in between. Jamplay has the most variety of material I’ve seen. The Jamplay lessons provide multiple camera angles, fretboard diagrams, quality instructors with thorough and structured lessons. This makes following the lessons super easy. I found too that they would go over common errors with certain techniques so that you could make sure you weren’t making those errors and provide guidance as to how to ensure you do the technique right. You’ve got the downside of any online lesson which is that you don’t get direct, real time feedback from your instructor but that’s balanced out by one of the great advantages of online lessons – in that you can pause and rewind and replay any part of any lesson as much as you need to. Let’s face it, if you don’t enjoy the lessons your motivation to complete them will be lacking. So any lessons need to be enjoyable. One way to ensure you enjoy your lessons is being taught by an instructor that you like – so with so many different instructors to choose from at Jamplay you’ll most likely be able to find one that you like. You’ll never get that back and forth interaction like you would in an in-person lesson but liking your instructor’s personality and their style of lesson will go a long way to helping you enjoy the lessons. Also things like how the lessons are structured, how interactive they are and the way in which they progress will add to or take away from the enjoyment. I think overall Jamplay have a done a great job here – and of course this will vary depending on the instructor you go with and your own learning style. Theory is not for everyone – but it can certainly contribute to making you a better guitarist. And depending on your circumstances you may require theory to be successful. There is plenty of theory instruction supplied in Jamplay’s lessons – more or less depending on the instructor and their style of teaching. Check out Phase 2 under the skill building lessons for the majority of Jamplay’s theory & music reading instruction. But there is also plenty of theory scattered through the lessons too. They have something called Jamchat – which allows members to have online discussions about all things guitar – from gear to lessons to artists and whatever else. You can also contact the Jamplay staff with any questions you might have. Online free online lessons will get top points here in my rating system (because they have the best price!). Otherwise points are awarded for reasonable cost, value for money and payment structure options. Jamplay, like in every other area, have done a really good job here. Considering the quality and the quantity that you get the cost is definitely reasonable making these lessons great value for money. And they also offer different payment options. You can pay monthly, quarterly and yearly with the per-month cost being cheaper for quarterly and yearly payments. Check out the link below for the current pricing structure. For the fact that you can pay for this much material for only $159 per year is outstanding value-for-money. 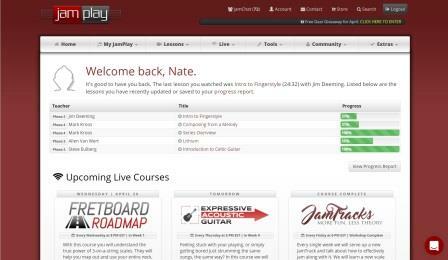 Final verdict – Jamplay is one of the best online guitar lesson providers going around, in my opinion. It’s no wonder they have such a big following. From what I’ve seen, they are the #1 lesson provider for anyone who has mastered the basics of guitar. Thanks for reading and I hope this review has given you enough information to go on and has helped you to decide if Jamplay is right for you. This is what I thought of Jamplay but don’t take my word for it – Check out the link below to try it out and see for yourself. Thanks for visiting. You’re right, it is really convenient and for some people, like yourself by the sounds of it, it might be the only option for learning the guitar. Glad you found the review helpful. I really enjoyed looking over your site. I am a guitar player, or at least I try to be one. My husband plays guitar and loves to collect them as well. I especially like how you broke it down for beginners, and most notably for song writers. I’ll be back to look at some more stuff and thank you for such a nice site. Thanks for your message. Glad you like the site – nice to hear that you find it helpful as a guitarist. Thanks for visiting and keep on playing!